We all know to keep calm because of all those t-shirts that say so and now there is a Christmas one so that you are prepared for the holidays. 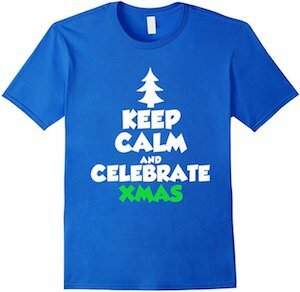 On the t-shirt, you can see a white Christmas tree on top and below the tree, it says “Keep Calm And Celebrate Xmas” and all the words are white except “Xmas” because that one is green. You can get this special calming Christmas t-shirt in styles for kids, women, and men and it is available in many fun colors to as well as sizes to fit us all. This t-shirt says it all and it sounds good to me. 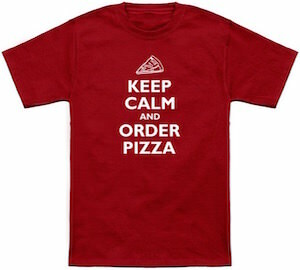 On this t-shirt you can see a slice of pizza with below it the text “Keep Calm And Order Pizza”. Keeping calm may not be easy for everyone but when you are eating a freshly baked pizza you stop worrying about almost everything and that means you are calm. 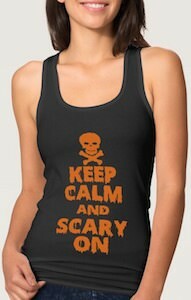 You can get this keep calm t-shirt in all kind of fun colors and in styles for both men and women. Made from 100% cotton this t-shirt is just perfect for you so now you just have to pick the color and select a size between Small – 6XL. On this t-shirt you will see a fun play on words that uses the popular “Keep Calm” saying and a reality TV show of Finding Bigfoot. 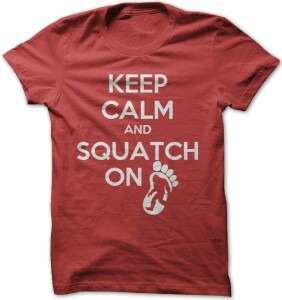 Find in large white block letters the saying of “Keep Calm And Squatch On”. At the end of this phrase you see a large footprint with a silhouette inside of it of the giant Bigfoot beast a Sasquatch. Made from 100% cotton giving you that perfect soft comfortable shirt that is also durable and will last a long time. Available in a wide selection of men’s fitted sizes that range from Small to 4XL. Also check out the ladies fitted t-shirts to get your Sasquatch print on. Featured on the front of this t-shirt is a play on words using that “Keep Calm” saying, find “KEEP CALM AND DRINK COFFEE” with a white silhouette of a steamy cup of coffee at the top. Of course how fitting as it is printed on a dark brown color t-shirt resembling the beautiful color of coffee. Availble in a huge selection of sizes that range from Small to 3XL this awesome t-shirt is made from 100% cotton to give yoiu a very soft and comfortable feel while also beign super durable to last a long time. Stay sane with this Keep Calm And Drink Coffee T-Shirt. This t-shirt witch is available in many fun colors and even plain white. On this t-shirt you can find one of the many Keep Calm text and this one says “Keep calm and do yoga”. Besides the text the t-shirt also shows a picture of a women doing the dancer pose to give you a good example at what you could be doing. This 100% cotton t-shirt is available in many sizes from XSmall – 2XL so that it fit a wide range of people that would like to promote some yoga. 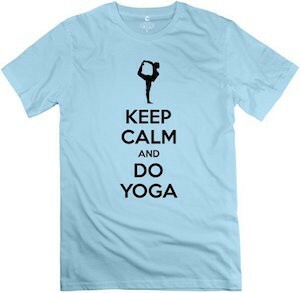 If you like to be calm and do yoga then you should get this Keep Calm And Do Yoga T-Shirt. For St Patrick’s Day or year round wear your favorite green t-shirt, like this awesome t-shirt here. Featured on the front of this t-shirt is a play on words using the popular saying “Keep Calm” and changing it to “Keep Calm And Get Drunk” along with a white silhouette of a shamrock. Available in many sizes ranging from Small to 3XL and is made from 100% cotton which will give you a super comfortable t-shirt while also being very durable. Also check out the different styles you can get this St. Patrick’s day print on like hoodies and women’s fitted shirts. Get into the St. Patrick’s Day Keep Calm And Get Drunk T-Shirt. If you are Irish and like to party then this maybe the perfect t-shirt for you. The shirt is green but comes in different greens and other colors to and on it you can see the typical “Keep Calm” look but the text here is a little bit different and more appropriate. It all start with a crown and below that the text says “I can’t keep calm i’m Irish”. And with this text you got yourself the perfect t-shirt for St Patrick’s Day or any other day of the year that you just need to be excited. 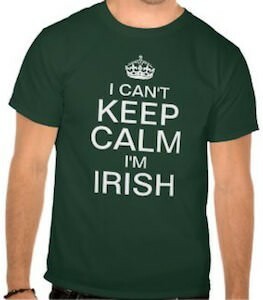 So if you are Irish and can’t keep calm then you just need this I Can’t Keep Calm I’m Irish T-Shirt. We all know those Keep Calm posters and other merchandise based on the World War II poster series and now there is one about fishing. This t-shirt that comes in a bunch of fun colors shows a fish and below that the text “Keep Calm And Go Fishing”. Great advice if you ask me. So next time when you are not 100% calm just go fishing and maybe wear this t-shirt so that people know why you are fishing. This fishing t-shirt is available in men’s sizes XSmall – 2XL so that many people can enjoy this fun design. 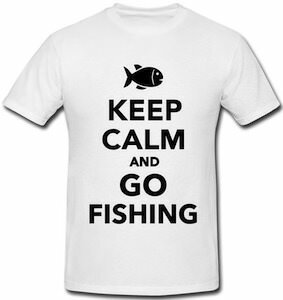 Get your fishing gear ready and wear this Keep Calm And Go Fishing T-Shirt.